The menorah, the seven-branched candelabrum, originally one of the sacred vessels of the Temple of Jerusalem, has become a symbol of both the Jewish faith and the modern state of Israel, symbolizing the continuity between the Jews of the Bible and contemporary Jews, and the rebirth of a Jewish state in the land promised to Abraham and Sarah and their descendants in the Book of Genesis. While that is its major focus, Fine also brings to light the fascination with and use of the menorah by Christians, especially Catholics, over the centuries, and even its depiction in Muslim mosques. The book begins with the sculptured image of the menorah on the Arch of Titus in Rome, erected by the emperor to celebrate his hard-fought victory over the Jews who had rebelled against Roman rule in 70 C.E. (the Common Era). Titus destroyed the second Temple of Jerusalem and brought back its sacred vessels, most prominently the menorah, to be placed in his own Temple of Peace in Rome. The relief shows Roman soldiers carrying the menorah, the altar of Divine Presence, a Torah (Bible) scroll and other sacred vessels plundered from the Jerusalem Temple, the same Temple that Jesus revered so much that he felt it must be cleansed. The menorah is described in the books of Exodus 25, the prophet Zechariah 4, 2 Chronicles and 1 Maccabees (which the author notes is preserved in the Catholic and Christian Orthodox Bible though not in the Jewish or Protestant Bibles) and referred to numerous times throughout the Scriptures. Fine weaves into his story references to the menorah in Jewish and Christian literature and scholarship over the ages, ranging from Josephus to modern times. He notes that menorahs can be found not only in synagogues around the world but in Christian churches as well, especially in Rome but also throughout the world. The menorah has long been sought by scholars and archaeologists, especially in Rome but also in Jerusalem, based upon ancient and medieval legends that it was secretly taken first to Constantinople and then back to Jerusalem. Fine, noting that the menorah can rightly be called the “Jewish Holy Grail,” documents these searches and their ultimate futility. He devotes an entire chapter to debunking the myth, still believed by many Jews, that the Temple menorah is hidden in the Vatican and notes the open access, especially since the Second Vatican Council, which the Holy See has given to Jewish scholars to search for it throughout the entirety of the Vatican Archives. 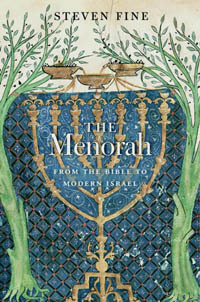 The book mentions the many references to the menorah in literature, including Arthur Conan Doyle’s Sherlock Holmes story, “The Jew’s Breastplate.” The volume includes 50 color illustrations ranging from Los Angeles to Europe to the modern state of Israel, which help the reader understand the book’s detailed stories and descriptions.